For every homicide, an additional 100 people are violently injured in the United States. An estimate of the long term costs of violent injury is $264 billion yearly. Our level I trauma center's violence prevention program (VPP) is designed to reduce our preprogram injury recidivism rate of 36.6%. The purpose of this study was to evaluate the VPP recidivism rate and conduct a cost-analysis comparing VPP programmatic cost to cost associated with treating interpersonal violent injury. We hypothesize that the VPP reduces recidivism and provides cost-savings in public dollars. Using the Microsoft randomization feature, we evaluated medical and financial information on 100 violently injured individuals who met our VPP eligibility criteria. Costs were then expanded to estimate for the entire eligible population in that year. We converted hospital charge data to total direct cost (cost to charge ratio). VPP annual budget includes salaries, travel and supplies. The three-year recidivism rate of the VPP was calculated. Extrapolated costs determined potential savings of an expanded VPP. Total hospital cost of the 100 subjects was $4,860,000. Average cost was $49,000. Our VPP recidivism rate was 11% (N=145). The VPP served 58 clients in 2007 with a budget of $168,000. 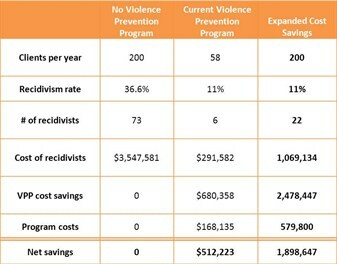 The table demonstrates current savings and expanded savings using an extrapolated cost model with an 11% recidivism rate. Eighty-three percent of our victims were uninsured or insured by public funding sources such as Medicaid. Recidivism was reduced substantially from historical figures. If we prevent just 3.5 re-injuries, our VPP would be cost neutral. If we expand we could save $2.6 million, mostly in taxpayer dollars. Violence prevention should be part of the fabric of trauma centers. It reduces recidivism and is cost effective by saving public funds. There is significant room for improvement in the evaluation of hospital-based violence prevention programs. To aid in this pursuit, we have constructed a violence prevention informatics program, with the aid of the software company, QuesGen. An abstract of the work appears below. This program is being considered for wider use and has been demonstrated to the Hospital-Based Violence Intervention Program Conference. The National Trauma Data Bank was developed for research and to standardize the process of evaluating the efficacy and quality of trauma centers. Hospital-based violence prevention (VP) programs have been implemented in many trauma centers. However, variables necessary to evaluate and assess programmatic quality are not woven into the trauma registry data. Our objective was to create a "culturally competent" database for both front-end users: the case managers, and for back-end users: researchers and QA personnel. Our goal was to successfully incorporate this into our VP program at two participating sites. Variables to capture quantitative and qualitative data were proposed and modified over a 12-month period. Proposals were initiated by both front end and back end users at both institutions and evaluated for relevance, ease of data entry, and capacity for analysis by all stakeholders. It was created with a Software as a Service solution on a LAMP platform. 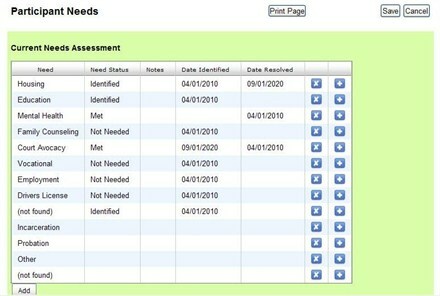 Each user has a security profile to allow or restrict access and restrict data for HIPPA compliance. Acceptable quantitative variables that were developed and institutionalized at both level 1 trauma centers included capture rate, needs assessment/risk factors, psychosocial structure, case management time spent, and long-term outcome measures. Qualitative variables implemented included graded quality of client/case manager relationship over time, and notes. Between the two trauma centers, the standardized database has captured 949 trauma patients through its link to the registries, recorded 333 eligible and enrolled 191 clients. Case managers have maintained records on all their clients completely electronically. Back end users can access all data on a spreadsheet and automatic queries can be run in seconds. A sample screen is shown on the right. Standardized data entry and evaluation of VP programs has lagged behind program development. We have codified a platform for capturing variables relevant to quality assurance and research for VP programs. This system was created in partnership with two level 1 trauma centers to assure exportability. It reflects cultural competency critical for VP programs by creating a user friendly data entry system with input from case managers. It allows for facile download of data for research and quality assurance personnel. Violent injury devastates urban underserved populations, but the impact over a lifetime is not well characterized. The disability-adjusted life year (DALY) measures the burden of disability and is used widely to describe the long-term impact of a particular disease or injury. The objective of this study was to calculate DALYs and lost wages attributable to violence and its consequences on physical and mental health. In this retrospective case series analysis, we conducted an in-depth review of 102 clients in our violence prevention (VP) program. We calculated DALYs using data from our trauma registry and VP program database and disability weights from the WHO. 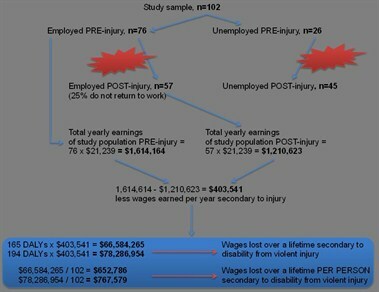 Using data on unemployment and salaries obtained from the Bureau of Labor Statistics, we estimated the earnings lost over a lifetime secondary to disability from violent injury. The mean age was 20 years. 39% had evidence of PTSD post-injury. Violent injury accounted for 165 years of healthy life lost. Disability weight for mental illness accounted for an 18% DALY increase. See figure for lost wages. When mental illness is included in disability, lost wages increases to $767,579 per person. Other studies have shown that in African American men, violent injury accounts for more DALYs than heart disease. In a population already suffering from high unemployment and high incidence of chronic disease, the physical and mental impact of violent injury creates another threat to this population's health and economic wellbeing. Violence prevention is necessary to save lives and livelihoods.